This year Yatzer will be reporting beforehand, through a series of presentations, the work of designers that will be showing their latest projects at Designersblock London 2009 from the 24th to the 27th of September. Designersblock London 2009 is an event presented alongside with this year’s 100% Design London exhibition , the UK's leading architecture and design event showcasing everything for the modern building and interior. Why presenting Designersblock London 2009 and the designers showing their work there? Designersblock is definitely more than a design show. It is a culture that has grown over 12 years of shows that include designers from different disciplines, places and with different levels of experience. Their shows work as a platform for an ongoing dialogue between the highest quality ideas, products and services. Their show was one of the core events in last year’s 100% Design. Moreover, it involved exhibitors in additional projects that ran alongside the show and were also continued throughout the year. This year Designersblock are bringing their 12th annual London show to 100% Design at Earls Court One, a 5000 square meter space dedicated to design. An interesting and challenging choice for the minds behind Designersblock, Piers Roberts and Rory Dodd, who in the past have successfully transformed empty spaces into thriving venues. This year the event will be communicated to their database of over 18,000 industry contacts, including over 2,000 UK and international journalists. Yatzer could not let you without an insight of the designers about to participate in this unique event. So, Yatzeriders... ready to hop on the double-decker and start the journey with talented Polish designer Alicja Wasielewska? Alicja Wasielewska was born in Kutno, Poland. In this event she is exhibiting as part of ‘Ready to Ship’, a group of graduates from Edinburgh College of Art. Her work, which concerns mainly the transformation from the natural form to inspirational structures, is clearly influenced by her interest in mathematics, geometry and natural structures. 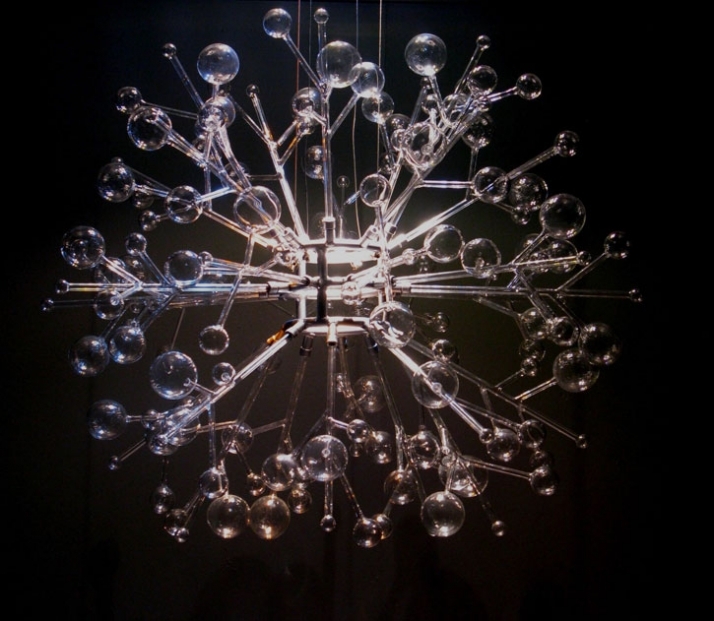 In Designersblock London 2009, Alicja decided to present two quite different chandeliers: ‘Mille Bolle’ and ‘Morph’. The first one, “Mille Bolle” is made of 30 elements of fragile, handmade quartz glass and handmade aluminum construction. The perfectly organized structure with symmetrical objects and the use of bulbs, gives an industrial look to the chandelier. When located in dark surroundings and with the light fallen from above, the structure reflects on the glass and aluminum, thus creating colorful patterns on the ground. Her second work is equally innovative and unconventional. 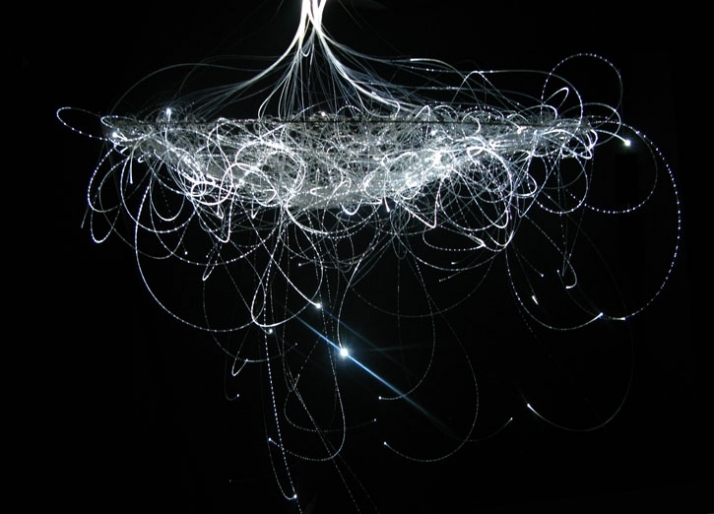 The ‘Morph’ Chandelier illustrates more random elements and is based on fibre optics. With these two projects, Wasielewska is clearly showing the contrast between different perceptions of structure and form. 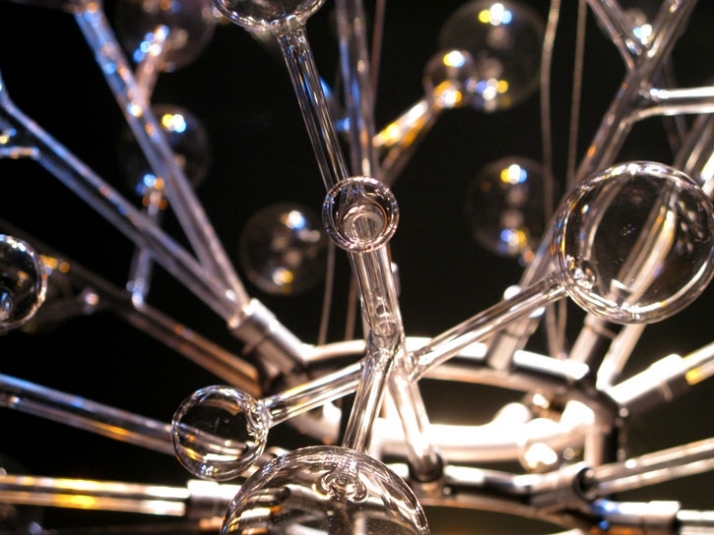 In both cases she successfully manages to reinterpret the traditional method of making chandeliers. As it is stated in the artist’s website “both of these [chandeliers] create their unique mood and influence the atmosphere in the surrounding environment. The chandeliers act as a focus for visualization and the communication of moods, impressions, emotions and the stimulation of the imagination”.